Ticket are free; reserve yours today! Rated PG-13 — What do parents need to know? 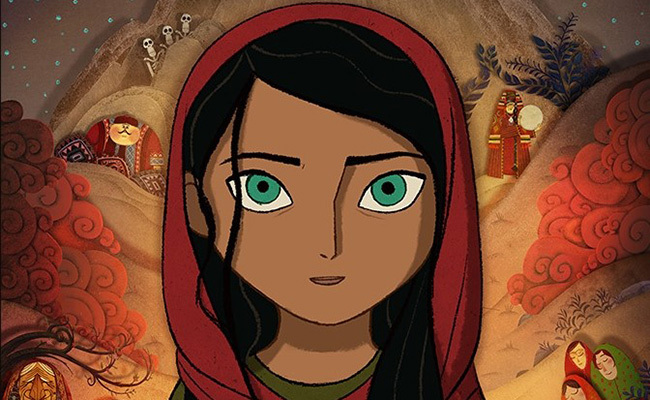 THE BREADWINNER is a beautifully animated drama from the co-director of THE SECRET OF KELLS, set in post-Taliban Afghanistan. Based on the young adult novel by Deborah Ellis, it centers on an 11-year-old girl who’s forced to pretend she’s a boy after her father is imprisoned. The movie heartbreakingly captures the violent, anti-women, anti-intellectual, and even anti-literacy stance of the Taliban regime. Women are harassed and beaten for not covering themselves properly, being in public without a husband/father, and drawing attention to themselves. Taliban soldiers and followers intimidate and threaten characters and keep one imprisoned. A few mild insults pepper the dialogue (“crazy,” “stupid,” “enemy of Islam,” etc. ), but it’s the realistic violence that’s most likely to upset younger viewers. There’s also a story-within-the-story in which skeleton ghosts, attacking jaguars, and an evil elephant king figure prominently, but it’s not as frightening as the mistreatment of people (particularly girls and women) under Taliban rule. And, ultimately, themes of perseverance, curiosity, and courage prevail. Nineteen not-for-profit organizations throughout the South Fork have joined forces to form the Hamptons Arts Network (HAN), designed to create a unified arts community in the Hamptons. The consortium’s goal is to promote collaboration, partnerships, and shared programming among its members, and to advocate for the arts in the areas of economic development, tourism, and education. HAN will create events to shine a light on the year-round cultural mecca located on Long Island’s East End. As their first event, they are proud to announce THAW FEST, a Hamptons-wide weekend festival to celebrate spring and promote the broadly diverse range of cultural programs and institutions that make the South Fork of Long Island unique. The 2018 THAW FESTwill offer three days of exhibitions, theater performances, film, music, garden tours, workshops, community engagement and family-focused events.